We are based near the village of Evanton, 20 miles north of Inverness. Inverness, the capital of the Highlands, is well-served by road, rail and air links. If you book a custom guided fishing adventure, we can often collect you from Inverness airport or railway station and take you to your accommodation. We are located 20 miles north of Inverness close to the main A9 road. 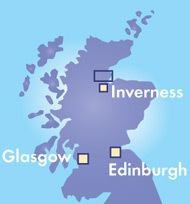 Inverness is approximately 175 miles (3 hours driving time) from Glasgow, 155 miles (2 hours 45 minutes driving time) from Edinburgh, and 575 miles (9-10 hours driving time) from London. There are multiple connections daily from London Kings Cross and Euston via Edinburgh and Glasgow. An overnight sleeper runs from London Euston. The map below highlights the approximate location of our base in Evanton.